On Friday the 7th of July I toured some Sacramento parks with the idea of a theme of green space. I had been invited to a dinner on Fair Oaks Blvd just north of UC Sacramento, so that was my ultimate destination. I figured that with a combination of walking, sitting, and possibly bus riding I could spend most of the day visiting park areas between downtown and the university. I got off the light rail at Alkali Flats station. This is a traditional neighborhood name for the area near to and just north of downtown. In this area of town, C Street is the northern-most useful street. It extends east into the fancy New Era Park neighborhood. It has three city-block-sized parks along it: John Muir Playground, Grant Park and Stanford Park. Then to the east of that is a large area referred to as Sutter’s Landing Regional Park, which is still under development. There is a lot of low-income housing in the Alkali Flats area. 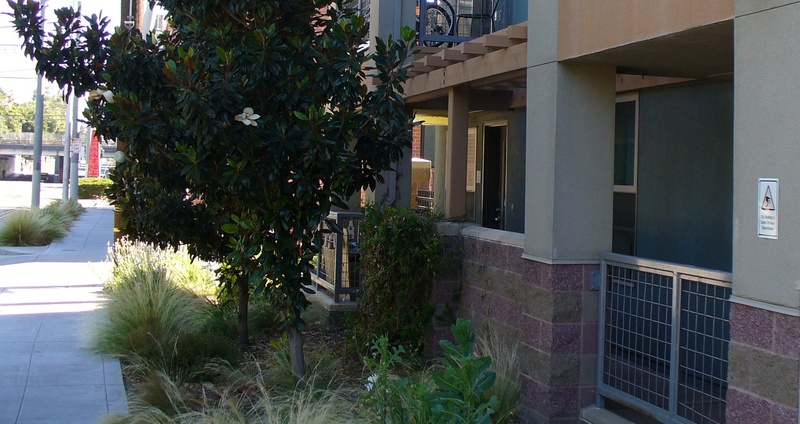 Here is an example of some green space provided in front of one such building. 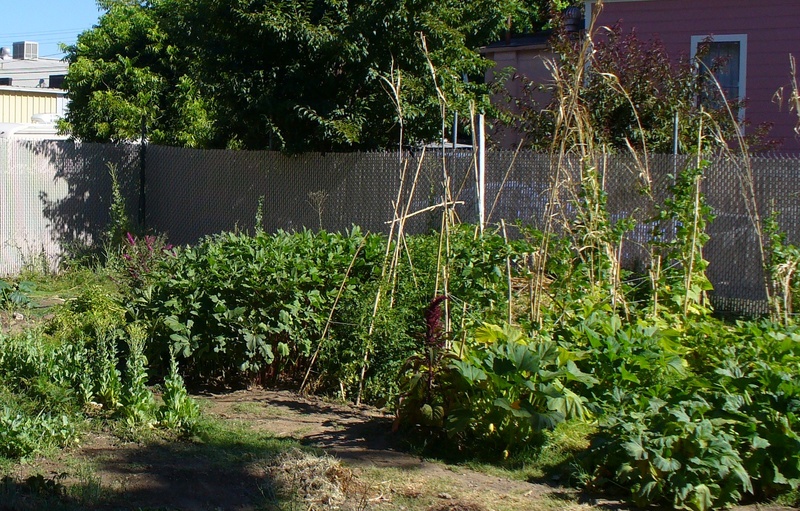 I call it “urban green space.” It is usually surrounded by concrete on all four sides. Next I encountered some urban gardens. I have not seen areas like this in the suburbs. John Muir Playground has a fence around it, and a sign inside stating “no adults allowed unless accompanied by a child,” or words to that effect. However, on this warm morning, no children were there. C Street then takes you to the Blue Diamond facility. There I found a nice example of “corporate green space.” This is a lot like urban green space, but more closely controlled and maintained. 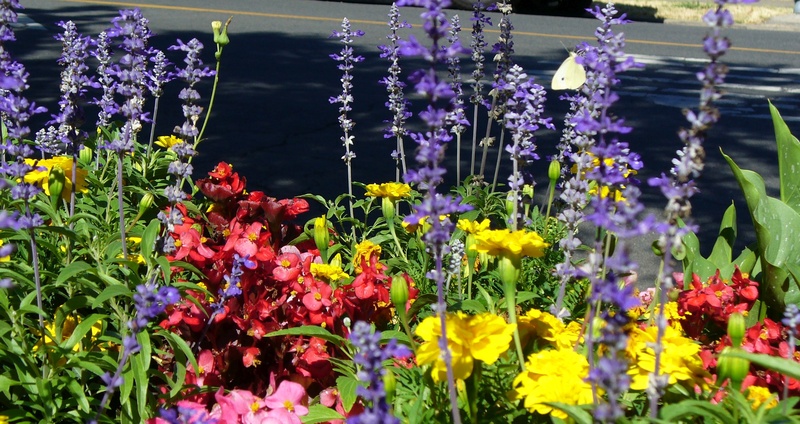 It can provide a lot of great color, but is ordinarily rather limited in extent and definitely requires watering. Companies here – and many residents – are still into lawns. See my Goose Poop article for related thoughts. 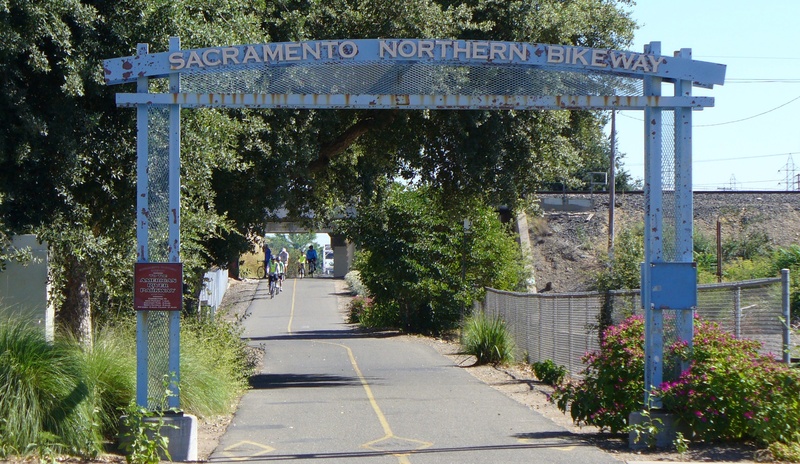 The area just north of the American river contains a system of bike paths, and a path connecting to that system exits into this neighborhood. That would have to be another trip. Grant Park has a baseball field that may also be used for soccer. The grass was mowed, but no one was there. At the east end of this park is “Blues Alley.” I went down this alley, but found no evidence for “blues.” I did, however, notice a column of smoke rising from the area I was headed towards. A grass fire. Stanford Park was another big (and vacant) field. At its far end is the entrance to the developed part of Sutter’s Landing Park. This park had previously served industrial or similar uses; most of it was pretty bare. The most-used developed area was the Dog Park. I walked into the small dog area and took some pictures. This park contains some manmade shade roofed with solar (photo-voltaic) panels, most probably linked into a nearby solar “farm” and to the panels covering the parking lot to the northeast. The most notable features of the parking lot were two killdeer madly tweeting at each other. A “covered skate park” was closed. Inside it was covered in graffiti and housed several pigeon families. However, per its website, it opens to skaters and skateboarders every afternoon. Just beyond that was the levee and the river. The levee is a key reason the American River Parkway exists. The levees began to be built in the mid 1800s in response to repeated flooding of Sacramento neighborhoods during peak flood season. Since then, flood control dams have been installed, and an extensive levee system has been completed up the American River (and also the Sacramento). Sutter’s Landing Park ends at a freeway at the edge of the East Sacramento neighborhood, not far from a railroad bridge. Here I found the blackened ground which could have been caused by the fire I saw smoke from earlier. East Sacramento neighborhoods run right up to the levee, which in this area is roughly 20 feet high. On the other side of the levee is the river and parkland which can flood if there is a lot of runoff upstream. I could find no obvious access to regular streets from the levee, so continued walking along it to the east. I found a sump pump installation at one point, but the maintenance gate leading to city streets was locked. I was now walking along an affluent neighborhood known as River Park, which is right next to the university. It was a lot of walking in the high sun. I was in long sleeves and wearing a big hat, but my nose and cheeks got burned, and my exposed hands. At Hall Park I finally found street access. This is near the access point from Hall Park. Hall Park is a nice park and includes a swimming pool. But even here I found someone who looked homeless sitting on a park bench. Sports field in Hall Park. I was able to walk out of River Park to a small mall, where I ate lunch at a Chinese restaurant. Just beyond that was the university entrance, including a nearby “mini-park” space with a garden fountain and a bench. To the right of the university entrance was the Arboretum. It was a well-developed “forest” and provided a pleasant place to stop and rest. Almost every plant was labeled with its botanical and common name, and where it is native. 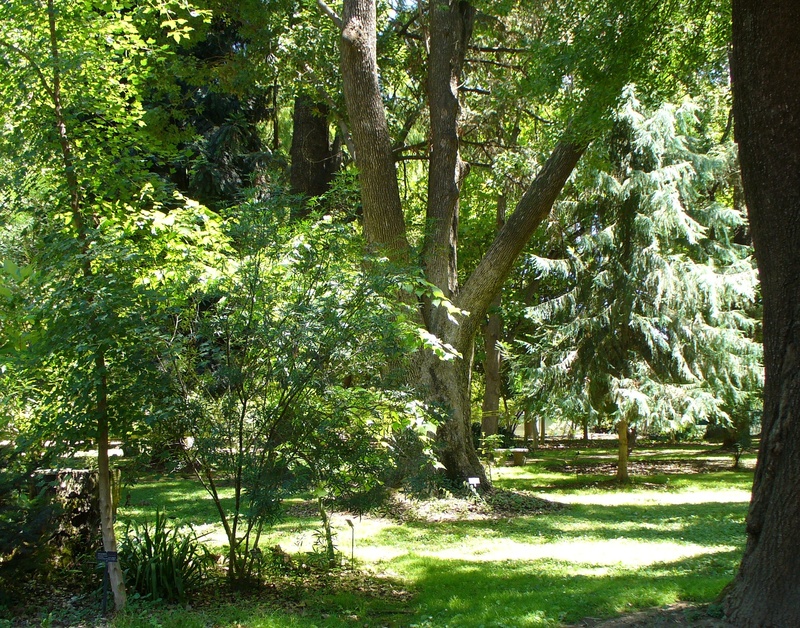 Though called an Arboretum, in included numerous shrubs and smaller plants. I had made it to Fair Oaks Blvd, but still had to make it across the river. 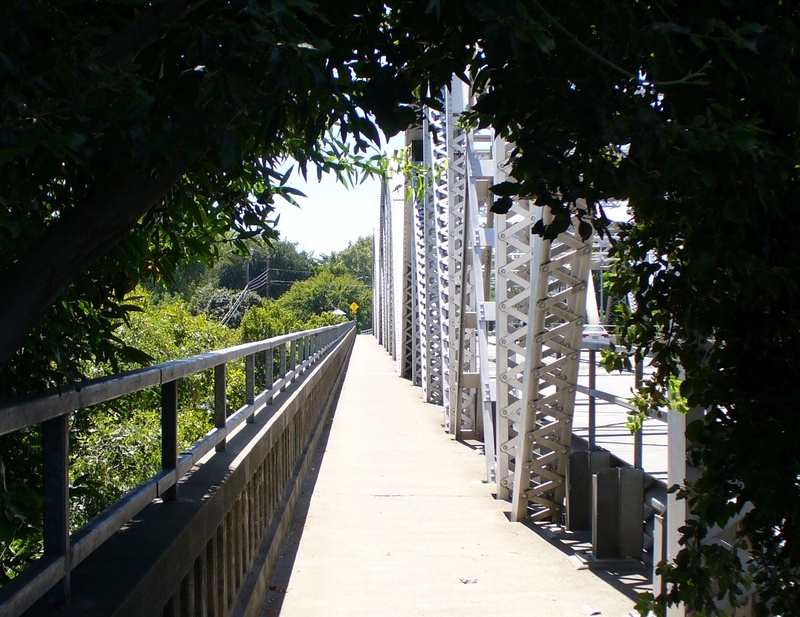 There was a footpath/bike path across the bridge. The north end was surrounded by shrubbery; very picturesque. Fair Oaks passed through a student housing area called Campus Commons where there was no ordinary commercial development. But I found the shopping area only a block or two up the street, designed in the usual suburban style, though a little more high-end than usual. As is normal in this style of development, pedestrian crossings of the main streets are few and far between. After getting an iced herb tea (and a refill) at a shop in the Pavilions Center, and browsing the Williams-Sonoma store, I sat for a while in a comfortable patio chair put out for shoppers. The two seated figures are sculpture next to a water feature. I was early; it was only about 4pm. When I finally decided to cross the street to the restaurant, I had to walk way down to a light to get across legally. But at least I had survived the trek. Tree squirrel at Sutter’s Fort. We are all aware that many animals share human environments with us. Besides the obvious organisms that take advantage of the fact that we leave behind a certain amount of trash, both inside and outside, there are the ones that live semi-wild in our garden and park areas. Perhaps the most obvious animals that share the urban environment with us are the birds. However, with my resources these are some of the most difficult animals for me to photograph. Robins, sparrows, swallows, and all their various relatives are familiar regulars in urban trees and bushes. Pigeons are also well-know, and often seem like a nuisance bird. In open areas you will see hawks and other raptors, indicating a considerable but hidden population of ground mammals (mostly rodents). Tree squirrels move around where we can see them, but the rest of those types of animals hide in underground areas much of the time. Home gardens and park areas may have water features (or regular sprinklers) that support additional animals. These include various amphibians and reptiles, insects, even fish. I should mention soil worms, though these usually only appear when we dig around or after it rains hard. Worms and other soil organisms are an important part of any ecosystem but are another group that does not lend itself to ordinary photography. We will also see some migrant species come through our cities. Many of us are not particularly aware of which animals are in this category. And there are some birds, like the geese and ducks pictured below, that you might think migrate but might actually be full-time residents. Some of these have lost the instinct to migrate due to being held in captivity over several generations. These geese are probably permanent Sacramento residents. I don’t know about the ducks. This is at Sutter’s Fort. Yesterday (Saturday 1 July) I visited a little museum on Auburn Blvd near Watt that has been known as the Discovery Museum, but will be known as the Powerhouse Science Center when it moves to its new downtown building (an old electric power station). This museum specializes in exhibits for children. Its original emphasis was probably the natural sciences, but it is moving into “hard” technology in a big way, with a “space mission” experience for kids, a planetarium, and more technology-related exhibits in the offing. The museum grounds include a park and pond. 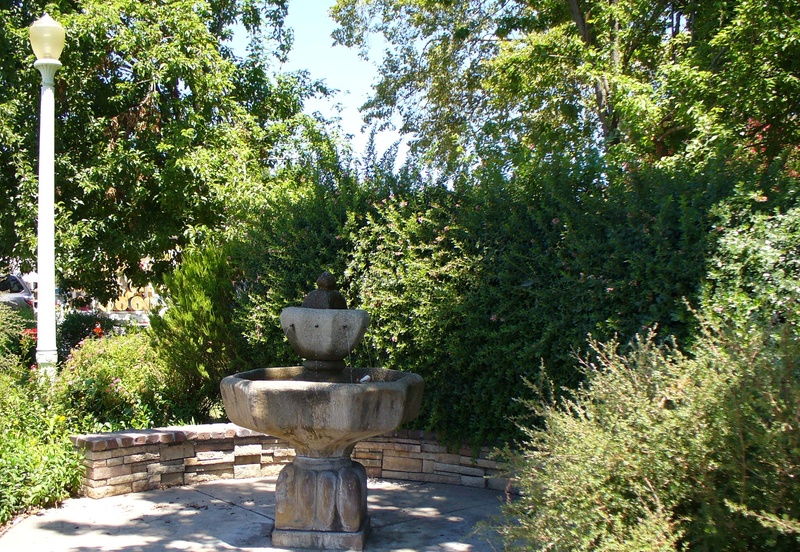 The pond is kept aerated by a fountain. Aeration is important for most urban ponds, as they are usually quite shallow and warm up a lot in summer, which deprives them of vital dissolved oxygen. This particular pond was probably seeded with many of the animals that now grow in it. It has a lot of turtles for just one pond and is teaming with developing frogs (tadpoles / polliwogs). I also saw many dragonflies and a hummingbird. I asked the flying animals to pose for photographs (a habit I’ve taken up, as it sometimes works) and a few dragonflies consented to do so, but the hummingbird would not stay put long enough for me to get a proper photo. Turtles sunning themselves at the Discovery Museum pond. 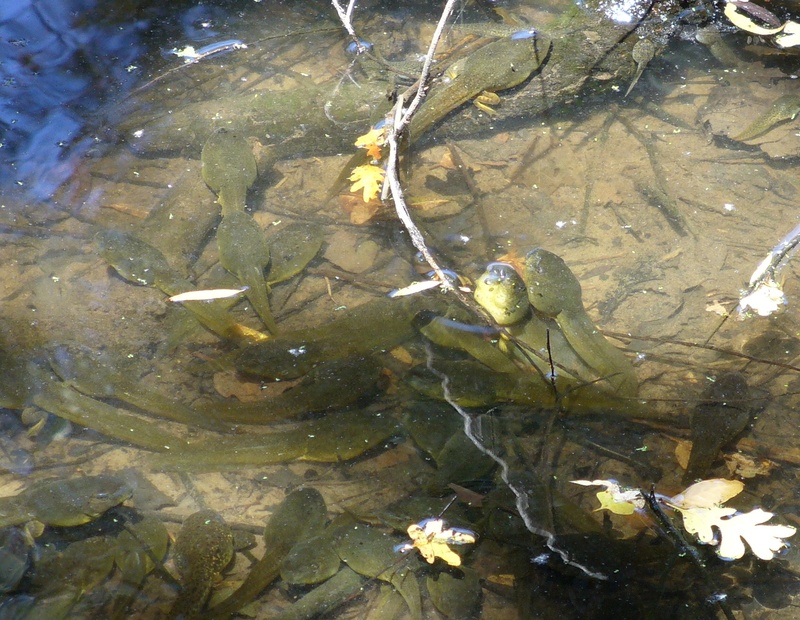 Tadpoles were teaming in this pond. The dragonfly that posed for me. Some of the first “wild” animals I ran into in Sacramento were ground squirrels at the Marconi-Arcade light rail station. I noticed them many times running across the tracks between their burrows and the public waiting areas. They are a bit nervous and so hard to photograph, but I got a few shots of them finally. One of the infamous track-jumping Marconi-Arcade ground squirrels.